Provide comfort for the family of William Wahlquist with a meaningful gesture of sympathy. Loving husband, father, grandfather, and great grandfather. 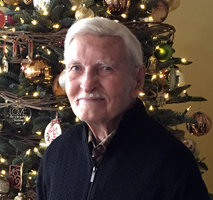 Staunch community supporter, WWII veteran, and a patriarch of Eagle Brook Church—Bill Wahlquist passed away suddenly on March 12. Remarkably vibrant at age 97, Bill enjoyed an independent lifestyle, living in his own home and traveling regularly around the country. On the day of his passing, Bill spoke at the annual White Bear Lake Town Meeting, sharing perspectives about the community he loved. Preceded in death by his darling wife Violet, he is survived by children Richard (Tina) of Woodbridge, VA, Donald of White Bear Lake, Larry of Duluth; 4 grandchildren William (Shanna), Brian (Jennifer), Bjorn, and Kaija; and 3 great grandchildren, Brayden, Kaitlyn, and Violet. Funeral services 2 pm Tuesday at EAGLE BROOK CHURCH, White Bear Lake Campus, Hwy 61 & Buffalo St, White Bear Lake. Interment Evergreen Memorial Gardens. Visitation preceding the service at the church from 1-2 pm. Memorials preferred to the Greater White Bear Lake Community Foundation. Arrangements Honsa Family Funeral Home. To send flowers in memory of William Carl Ludwig Wahlquist, please visit our Heartfelt Sympathies Store. Provide comfort for the family of William Carl Ludwig Wahlquist by sending flowers.